The compact and small size allows you to take it everywhere, very easy to set up with USB ports just plug and play. It's can be a very good gift to the child, enjoying lifelike cortoons while protects their eyes from TV direct light. Amazing movie projector,economical price with just limited storage,order soon,don't miss it! 1800 LMS LED Light Output brightness 1080P supported-Fixeover GP80 video projector can give a great movie viewing experience. upgraded better for indoor and outdoor movies. Color saturation increased by 30%, The brightness increased by 20% , Not suggested for PPT or business presentation. 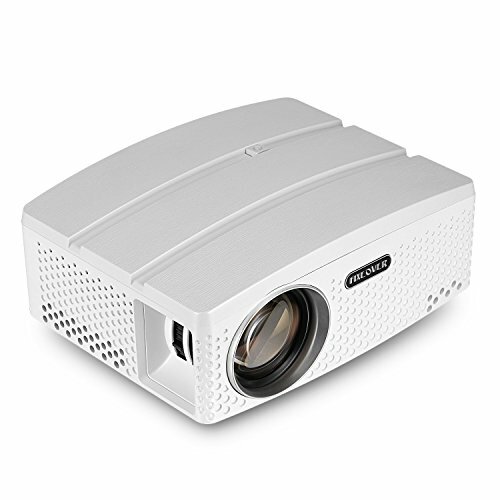 Full HD projector with high resolution-Native resolution 800*480 support resolution up to 1080P. The contrast ratio is 2200:1. Aspect Ratio is 4:3/16:9. 480P, 720P, 1080P are all supported. Multimedia Connection-LED Projector has HD portx2, USBx2, VGAx1, AVx1 3.5mm Mini Jack, SRS Speaker 5W. Compatible with PC/laptop/Blue-ray DVD player/ TV box/Amplifier/Amazon Fire TV Stick/ Chromecast/PS3/PS4/XBOX. Perfect for family entertainment time, watching FIFA WORLD CUP, NBA, NFL sports events, and playing video games. projection image size 28"-180" from distance 1.2M-5.5M. long led lamp life of 30,000 Hours. Satisfactory guaranty-12 months no worry purchase. we dedicated to provide the best customer service and technical support, any problems we're here to help. If you have any questions about this product by FIXEOVER, contact us by completing and submitting the form below. If you are looking for a specif part number, please include it with your message.